Murals are big. They are like huge boards, canvases, or walls you collaborate on. Get comfortable zooming and scrolling (moving around) quickly. If something is too small to read, zoom in to see the detail instead of making it larger. When you create your first mural, the default zoom is 100%. This means you are seeing the real size of each element you add. If you're using a trackpad on Firefox or Internet Explorer, you can zoom by holding 'ALT' and sliding two fingers up and down the trackpad. If you're using a mouse, just use your scroll wheel to zoom in and out. When the zoom level changes, you'll see on the screen which zoom level you are currently seeing. 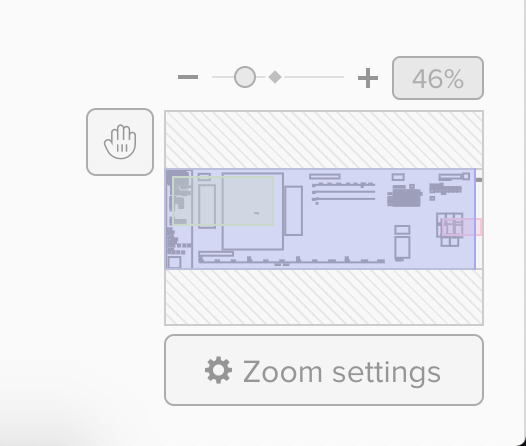 To zoom in on a particular part of the mural, hold Z + marquee select that area. To zoom out, hold ALT + Z and click. To scroll (move around) with the mouse, hold spacebar and click + drag the background. Or, use two fingers on trackpad to scroll, like scrolling in a document or website. Now, you can quickly get anywhere you want on a mural, impressing your colleagues with your vast knowledge of shortcuts and navigation tools. Bonus tip: see how MURAL's on Jim Kalbach uses navigation here on our blog: Know Your Scales in MURAL.